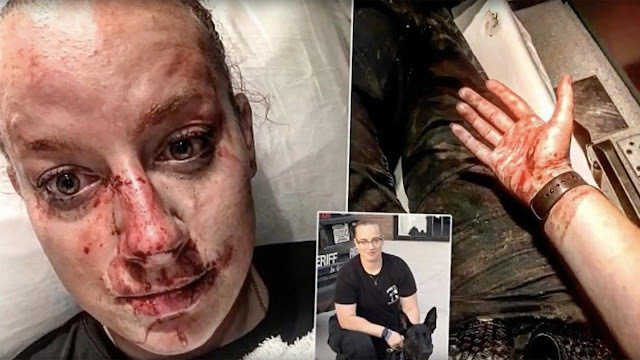 A female West Virginia sheriff’s deputy is lucky to be alive after a violent fight with a suspect who was allegedly high on drugs. She shared her experience on social media to encourage her fellow officers to get training in hand-to-hand combat. According to KHQ-TV, K9 Deputy Kristen Richmond of the Brooke County Sheriff’s Department encountered what could have been a life-or-death situation with a purportedly drug-addled suspect early Friday morning. Richmond responded to a call at Bethany College in Bethany, West Virginia, to address an incident in which a man was reported to be throwing things out of a third-floor window on the school’s campus. KHQ reported that the suspect was later identified as 21-year-old Brandon Lamar Jackson of Georgia. The station reported that Jackson “appeared to be on drugs and hallucinating,” and began fighting with Richmond. WTRF-TV reported that after the altercation with Richmond, Jackson was transported to the hospital for treatment of his injuries. The station noted that the incident remains under investigation. Charges against are Jackson are pending. What did Richmond have to say about the incident? In a lengthy Facebook post — which has been liked and shared over 100,000 times — Richmond wrote what she called “probably one of the rawest posts” she’d write. Richmond said that the fight lasted about five minutes. “During said altercation, my glasses were shattered and knocked off my face, none of my radio transmissions got out, and a ton of equipment was stripped from my vest and duty belt,” she explained, but added that despite all this, she was able to remain in the fight. Richmond said that she was able to secure one of the suspect’s hands in cuffs, and also released her K9 partner — but the purportedly drugged-up suspect kept on coming. Richmond said that after approximately five minutes of exchanging blows with the large suspect, her partners finally discovered her, and collectively, were able to subdue the suspect. “Thankfully, it did not reach that point,” she added, and credited that fact to her training outside of work. Who does the officer gives credit to? “Last, but not least, this is for the families, friends, and/or critics,” Richmond wrote. “After hours at the hospital and being treated for a broken nose, a fractured sinus, and some other minor bumps and lacerations to my hands, face, and head I went home. “I took my bloody uniform, duty belt, and gear inside with me and dropped it on the floor,” she continued. “I took my tired K9 partner to her crate so she could get some much deserved rest. “I went upstairs, undressed, turned on the hot water in the shower, stepped in, and washed his and my blood off my body,” Richmond wrote. “I watched it circle the drain not knowing whose exactly it was. Not a lot of people know what it’s like to do that.